SEVEN girls, mostly adolescents, working in a firecracker factory in Beed district of Maharashtra were killed and six others injured when the explosives kept on the premises caught fire causing an explosion. Eyewitnesses said the impact was so severe that the workers were blown apart. Their body parts were strewn in a kilometre's radius. The remains were identified with the help of ornaments and clothes they had worn. Two factory employees Shaikh Fazal Mohammad Hussain and Ashok Sripati Ingole were arrested by the police and have been charged with criminal negligence.A case has been registered against the factory--Chandan Fireworks.At the time of the explosion, over 15 labourers were working in the three rooms from which the factory operated.Two of the deceased girls, Bhagyashree Sonawne and Kanchan Gaikwad, were 13 and 12.One of the injured, Shivshankar Kalyan Lad is five.The factory is located in Neknur village, 24 km from Beed.Its owner Sheikh Saleem Sheikh Shahnoor took permission from the district collector to operate the factory but did not get it registered under The Factories Act, 1948, which is mandatory. No action has been taken against him yet.The workers were contract labourers who earned Rs 40-50 a day depending on the number of firecrackers they could roll. Authorities said the factory owner did not observe safety rules prescribed by Maharashtra Factories Rules, 1963. There were eight workers in one room, double the number the rule permits. They should have been wearing cotton clothes but were clad in synthetics. 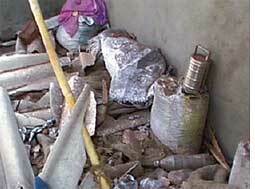 There are seven firecracker factories in Beed. Two, in Gevrai tehsil, are registered. "These factories operate from remote villages. It is difficult to monitor them," said S B Kolapkar, joint director of divisional office industrial safety and health for Marathwada region.